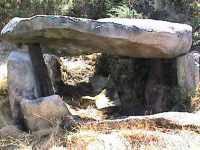 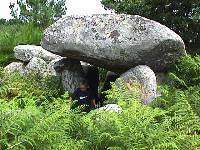 The dolmen are megalithic tombs built of stone. 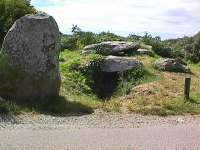 Most were probably covered by a mound of earth and/or stone. 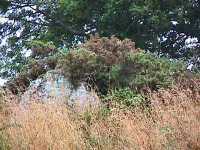 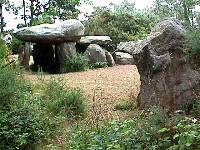 The older ones were family or community graves, used over many generations. 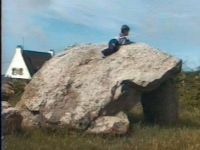 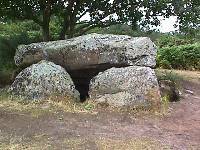 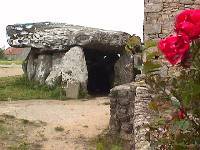 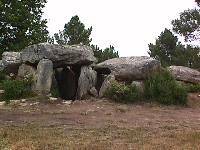 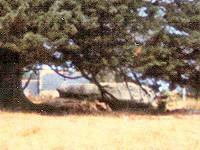 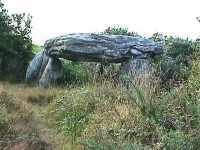 The oldest dolmen in the Carnac area was built 1000 years before the pyramids in Egypt. 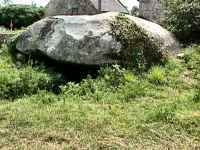 There are two main types of dolmen: passage graves which were covered by circular mounds and gallery graves which were covered by long mounds (called round barrows and long barrows in Britain). 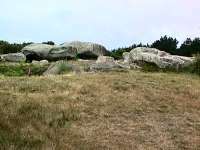 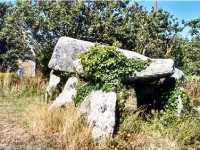 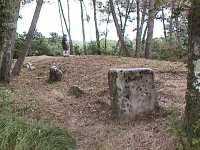 Most of the dolmen in the Carnac region are passage graves. 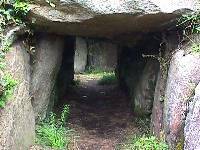 Other large groups of passage graves are found in southern and western Spain, southern England and in central Ireland. 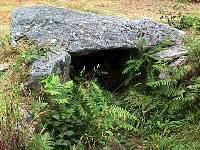 Gallery graves are more widely distributed throughout France and the rest of Europe, especially in northern Germany, Scandinavia and Britain. 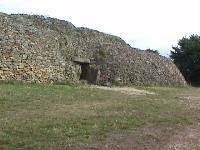 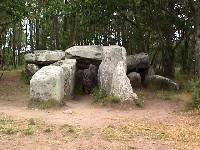 There are some particularly large gallery tombs in the Loire Valley in France. 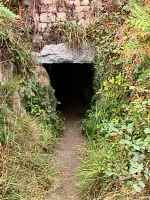 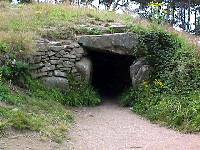 The simplest and oldest form of passage graves is a round or rectangular chamber connected to the entrance by a corridor. 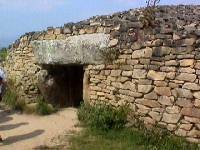 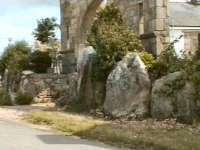 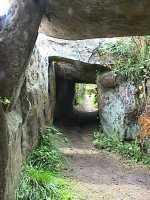 The passage was lined with upright stones covered by horizontal lintels. 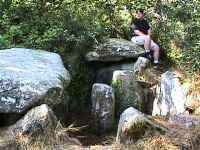 The chamber, also lined by large stones, was roofed either by huge, flat stones called capstones or by a corbelled dome. 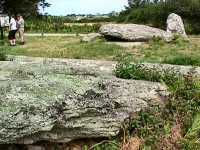 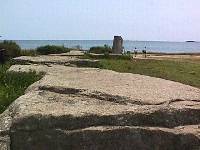 Some of the capstones weigh 40 - 50 tons. 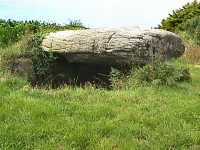 Later three variations of the simple passage dolmen evolved. 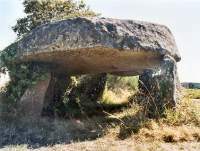 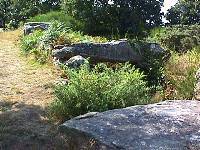 The wedge-shaped dolmen had no distinct separation between the passage and chamber; the passage was simply wider at the inner end than at the entrance. 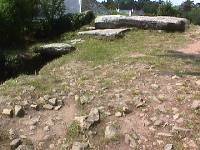 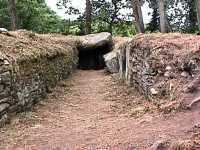 The second type is a very long wedge-shaped tomb with a bend of up to 90° about half way along the passage. 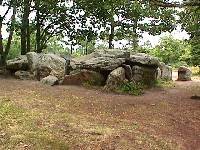 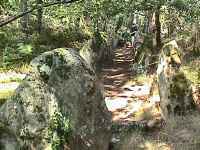 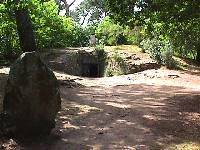 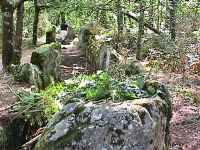 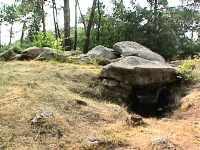 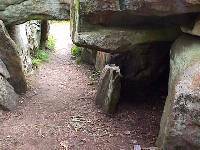 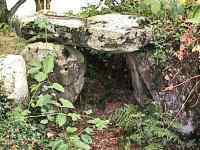 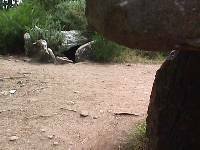 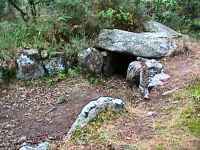 In the transeptual passage dolmen, one or more side chambers open off the passage near the inner end. 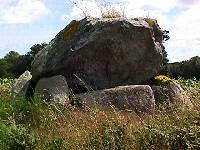 This last type is not very common around Carnac but is the major type in Ireland and the Orkney Islands north of Scotland. 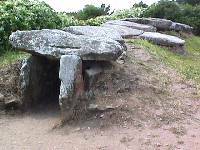 The gallery tomb is a long rectangle, often divided into compartments by slabs of rock, and covered by a long mound of earth and stone. 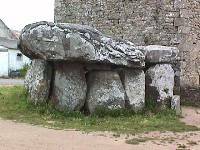 They are either roofed with large capstones or the walls are inclined to rest against each other forming a triangular chamber. 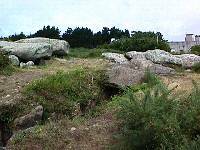 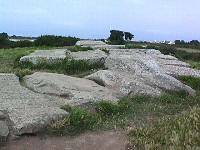 The map below shows the locations of major dolmen in the region around Carnac and the Gulf of Morbihan. 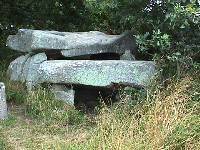 There are more dolmen than are shown here; some are badly destroyed, others inaccessible in woods or farmer's fields and still others not marked on maps and only found by pure luck. 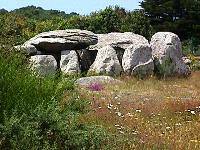 We could not find all the dolmen marked on our maps. 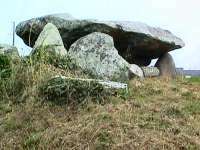 Hopefully more will be located and photographed in future trips to Carnac. 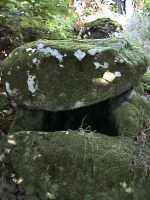 Fine engravings - boats, face? 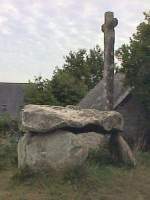 23 of the 29 supporting stones and the capstone are engraved; the symbols used are found at neolithic (New Stone Age) sites from Scotland and Scandinavia to the Canary Islands.